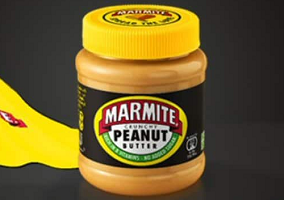 Consumer goods giant Unilever has extended its Marmite yeast extract brand into a new category in the UK with the launch of Marmite Peanut Butter. According to Unilever, Marmite Peanut Butter “retains the umami taste of Marmite, but mingles these classic flavours with the smooth and salty flavour of peanut butter to create a delightfully savoury blend”. The new launch is said to feature the “recognisable brand colours” of Marmite while also having the appearance of a traditional peanut butter. It is promoted as being suitable for vegans, rich in B vitamins, and free from sugar and palm oil, and is being launched in a 225g size for an RRP of £2.50 ($3.30). Commenting on the launch, Camilla Williamson, brand manager at Marmite said: “The British public asked, and we listened. It’s the most exciting product launch since Marmite began in 1902. With the total spreads category in growth, it’s the perfect time to unleash this mind-blowing new combo to Marmite fans and really give them something to talk about”.